Pork Embutido is a Filipino-style meatloaf made with a festive mixture of ground pork, carrots, and raisins wrapped around slices of eggs and sausage. Steamed to perfection, they’re great for everyday dinner meals as well as special occasions. Embutido is a Filipino-style meatloaf made with ground pork, chicken or beef, shredded carrots, crushed pineapple or sweet pickle relish, and raisins. The meat mixture is rolled around hard-boiled eggs and sausage into a cylindrical log and wrapped tightly in foil. The foil-wrapped meatloaves are then steamed or baked in a water bath until cooked through and set. They can be served cold or lightly-fried until golden brown. Making embutido is usually reserved for special occasions due to its somewhat involved prep process but I see no reason why it can’t be enjoyed every day of the week. Not only can you easily double (or triple) the recipe, the steamed loaves will keep well in the freezer for up to 3 months and can be easily reheated for a quick meal. Once or twice a month, I roll up my sleeves, roll up a dozen or so meatloaves, and store them in the freezer to have handy when craving hits. Keeping a steady supply in the freezer has certainly saved me from having to worry about dinner on busy weeknights or when I have unexpected guests. You can never go wrong with a few of these rolls thawing in the fridge!They’re delicious paired with rice (and banana catsup, pretty please) for a satisfying dinner or sandwiched between pandesal for a quick mid-afternoon snack. Pork embutido is a Filipino-style meatloaf made with a festive mixture of ground pork, carrots, and raisins wrapped around slices of eggs and sausage. Steamed to perfection, they're great for everyday dinner meals as well as special occasions. In a pan over medium heat, heat about 1 tablespoon of oil. Add onions and cook until softened. Remove from pan and allow to cool completely. In a large bowl, combine ground pork, crushed pineapple, carrots, sauteed onions, raisins, ketchup, beaten eggs, salt and pepper. Mix well until evenly distributed. On the center of a 12-inch aluminum foil, spread 1/3 of the pork mixture creating a rectangular shape. Arrange sliced eggs and Vienna sausages in the middle of pork mixture. Carefully roll mixture to form a log of about 3-inch in diameter. Wrap the foil around the meat and crimp ends of foil to seal tightly. Double wrap roll with foil. Repeat with remaining pork mixture. In a roasting pan, add about 2 inches of water. Arrange foil-wrapped pork mixture on a roasting rack and position rack on top of the water-filled pan. Bake in a 375 F oven for about 50 to 60 minutes or until juice runs clear when pork rolls are pierced with a knife. Let stand for about 8 to 10 minutes before opening foil. In a pan, heat about 1 inch deep of oil. Add embutido and cook, turning occasionally, until lightly browned on all sides. Let stand for about 3 to 5 minutes before slicing into desired thickness. Serve hot. Can I make this without the egg and the Vienna sausages? I’m pregnant and I don’t like the thought of consuming egg that has been frozen! And i also don’t like Vienna sausages. I’ve followed the measurements and steamed my embutido and have to say this is simply the best! So good that my family loves them so much that they couldn’t forget about it. I wished I have found this recipe earlier! Now, I’m eager to try your other dishes! Hi Ms Lalaine! I just want to say i am an avid fan. basta lutong pinoy i see too it that i check kawaling pinoy first. question about this recipe po. if i want to add liver spread, which part of the steps would i do so? I am so happy you find the recipes here useful. I am sorry but I’ve never tried adding cassava to pork embutido. For what purpose? As extender or thickener? I don’t think cassava will be a good option; you might want to try breadcrumbs instead. bago ifreeze yung embutido, dapat bang luto na? Hello po! Can i use the steamer for siomai po jnstead of the stainless steamer i have seen in you tube?.. thanks a lot po! Yung steamer ba na bamboo? Yes pwede siya basta kasya yung pork roll sa loob. 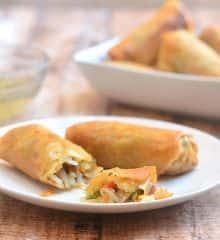 This Embutido Recipe is one of the Great Pinoy Recipe. I Actually made this one with some twist and can be seen on my Blog. hi again..is it ok if i skip the crushed pineapple or it would taste different? You can omit it if you want. I like to add it because it adds tangy and sweet flavors like sweet relish would. ask ko lang po kung ano pinaka the best na binder para sa embutido na kahit i cut sya buo pa dn sya?ty! Itlog lang ang gamit ko and I don’t add flour or bread crumbs. They shouldn’t fall apart pagka cut basta let them cool well first before slicing. Hi. Can I use pressure cooker instead of a steamer or instead of baking? I am sure you can as I usually do meatloaves in my Instant Pot. I do 20 minutes on high pressure for my meatloaf but since these embutido loaves are thinner, you might want to try 10 to 15 minutes. Hi! I’m sure I can use my Instant Pot to steam the embutido rolls but I am curious if you’ve tried that method and how long did you steam the rolls? Thanks! I’ve never tried embutido but I have made meatloaf in my Instant Pot and I am giving the time and procedure would be the same. Depending on the thickness of the loaf, I would say about 10 to 15 minutes on high pressure. I am sorry I can’t be more specific, embutido in the Instant Pot is definitely on my to-do list now! Just put the embutido with the foil intact in resealable bags and store in the coldest part of your freezer. They’ll keep well for 2 to 3 months. I’ve cooked your embutido countless times ate lalaine. The whole family loves them so much. Thank you so much for the inspiration. God bless you more! Thank you for the feedback, Krissy. This embutido is a favorite here in our house so I am glad your family liked them as much. Hi Ms. Lallaine, i’ve been cooking your recipes for a while now and it works like a magic to me. I never cook my whole life before i found your blog. I’m now planning to cook Embutido for my pregnant wife this coming weekend. I’m looking forward for your upcoming recipes. Ok pa rin bang iluto kahit seven days na sa chiller yung embutido? Thanks! I usually don’t keep food in the refrigerator longer than 3 days, yun kasi ang recommendation nang Department of Health when I used to manage a commercial kitchen. Kahit kasi walang amoy, the food might not be safe to eat. If it was in the freezer, good siya for a few months because of the sub zero temp. I just checked it, will you please try again? Gano po katagal pedevi freeze? It will last for a few months in the freezer basta maganda ang pagkabalot at stable ang temp nang freezer. Yes, ok lang without flour and bell peppers. 🙂 Just make sure you roll the embutido tightly para mabuo nang maayos. Hi Lalaine, can i substitute pork with chicken coz i am a Muslim and want to try your version of embutido? Will it suit the other ingredients? I just want to confirm that the set up will be same as steaming but, I will be baking it instead of ordinary steaming lang? Yes, bain marie siya, para na ring naka i-steam but sa oven. Lagay lang yung mga embutido sa isang rack and then set the rack on a pan of water, para lang nakaangat ang embutido sa water. Nako…..ang sarap naman! Thank you for your delicious recipe. It’s wonderful!! Next time, put less of the salt you think you need then pan-fry a small amount of the pork mixture and do a taste test. You can can adjust seasonings, if necessary (salt, pepper etc). Your recipes are really, really good! They are also easy to follow and always have these inspiring and lovely introductions which I love to read. Have been using your recipes since last year when I found your best leche flan recipe which I receive so many good compliments with..:-) From then on, I’ve been dependent of your blogs.. Thank you so much for sharing all your amazing recipes! God bless! First time to make embutido and it’s a hit!! Thanks for the delicious recipe. Btw, before i put it in the freezer, do i have to steam/bake it first? Yes, cook it first then all you have to do when ready to eat is thaw it out and pan-fry. Enjoy! Hi Lalaine, because im in india I can’t find banana catsup, can I used tomatoe catsup? Yes, you can substitute tomato catsup. You can add stir in half a teaspoon of sugar to the tomato catsup, if you want, to get the sweetness of banana catsup. Enjoy!